Local Testing allows you to test your private and internal servers, alongside public URLs, using the BrowserStack cloud, which has support for firewalls, proxies and Active Directory. Local Testing establishes a secure connection between your machine and BrowserStack servers. Once you set up Local Testing, all URLs work out of the box, including those with HTTPS, multiple domains, as well as those behind a proxy or firewall, and much more. If you have already installed the features extension after signing into BrowserStack, Local Testing will be enabled. There is no additional setup required. 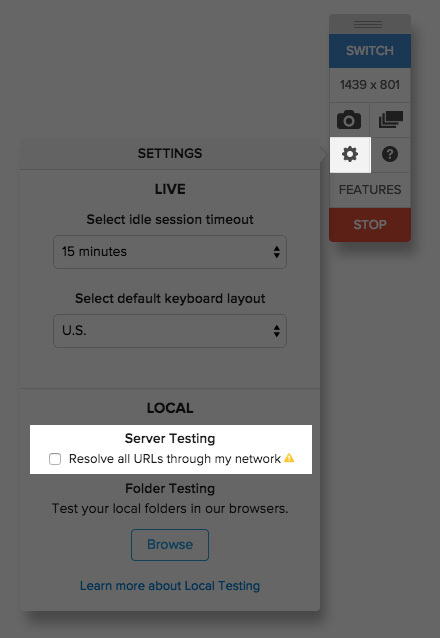 Users have the option of ensuring all traffic routes via their local machine exclusively by selecting the Resolve all URLs through my network checkbox. For example, if there is a public URL like "browserstack.com", but you have /etc/hosts entry for "browserstack.com" mapping to localhost or some other IP, this option will drive all 'browserstack.com' requests from remote browser/mobile device via your machine. Note: This extension is available at the Chrome app store. Warning: Enabling this option slows down the websites on the remote browser. 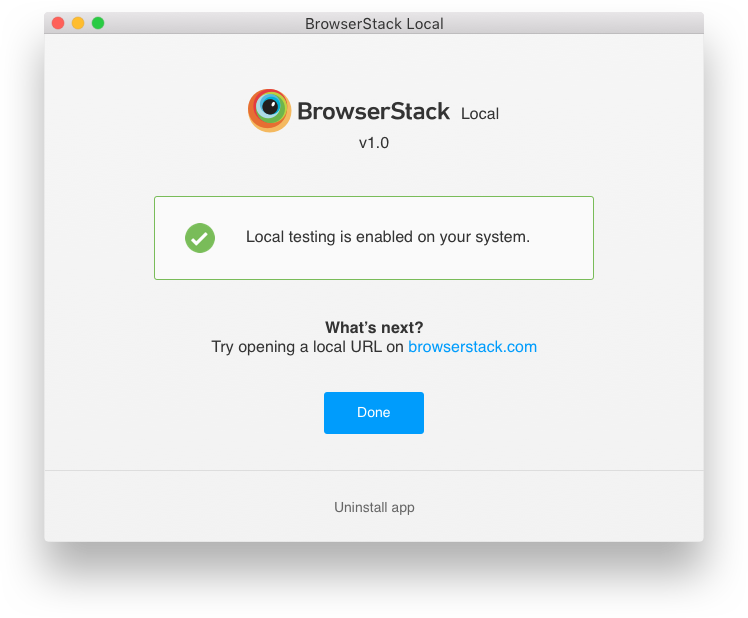 If you have already installed the BrowserstackLocal app after signing into BrowserStack, Local Testing will be enabled. There is no additional setup required. You can verify this by starting a session and looking for Local enabled sign as follows. For mac users: Click on the BrowserstackLocal.dmg and drag it to applications folder. Start the app to enable local testing by clicking on the BrowserstackLocal app in the Applications folder. For windows users: Click on the BrowserstackLocal.exe, install and run it. Once you start the BrowserstackLocal app successfully, you will see the following app screen. Use the steps below to setup a Local Testing connection or view our use cases for more help. Navigate to the folder containing the binary, and run it from the command-line interface. A Local Testing session would have been initialized for Live and Screenshots. Automate users can now start running local tests. Note: Learn more about using Local Testing for Selenium Tests. Note: To extend functionality further, here is a complete list of modifiers for the binaries, or view our use cases for more help. Enable Local Testing and type the address, for example localhost:3000, in the remote browser, and browse as you would on your local machine. Enable Local Testing and type the address, for example staging.example.com, in the remote browser, and browse as you would on your local machine. Enable Local Testing and type the address, for example https://localhost:3000, in the remote browser, and browse as you would on your local machine. Enable Local Testing and type the address, for example staging.example.com, in the remote browser. If there is content served from other URLs like assets1.staging.example.com and assets2.staging.example.com, they will work the same as on your local machine. Enable Local Testing and type the address, for example dev.example.com, in the remote browser. If there are subdomains like user1.dev.example.com and user2.dev.example.com, they will work the same as on your local machine. When using Local Testing, your /etc/hosts file is respected by default, and the public setting is used only when there is a conflict. To ensure that all the traffic is routed via your local machine, select the Resolve all URLs through my network checkbox when enabling Local Testing. Type the address in the remote browser and browser as you would on your local machine. Enable Local Testing, and select a folder for testing. Type the address in the remote browser and access as normal. When using the command line to enable Local Testing, specify the folder with the --folder parameter to test the local folder. Note: Local folders can be tested alongside private and internal servers using the dashboard, but must be set up separately when using the command line binaries. Warning: URLs generated for local folders can only be opened on BrowserStack remote machines. They are neither accessible from your local browser, nor from any other machine. When using the command line to enable Local Testing, setup the connection using the --proxy-host and --proxy-port parameters. When using the command line to enable Local Testing, setup the connection using the --local-proxy-host and --local-proxy-port parameters. The following function checks to see whether the hostname is localhost, and if so, whether the connection is direct. If the hostname is not localhost, the connection is via proxy. If your private or internal server is behind a firewall or only accessible through VPN, all you need to do is set up Local Testing. There is no extra configuration required; only ensure that your machine can access the private server. For more information, contact support. If you are testing a server that requires IP whitelisting, set up a Local Testing connection and select the checkbox. You only need to ensure that your machine has access to your restricted server, since all requests are sent via that machine. Here, we have created a named connection called Test123. -h, --help Display the help text. -V, --version Display the current version of the binary. -F, --force Using this option kills all other instances of BrowserStack Local binary running on this machine with the same --local-identifier options. This option will not affect binaries running in remote servers and instances running with different --local-identifier options. --force-local Route all traffic via machine where BrowserStackLocal Binary is running. Local tries to fetch public urls directly, unless this option is specified. --only-automate This option restricts Binary usage to Automate product, and it cannot be used for Live/Screenshot testing. --proxy-host HOST If you are behind corporate proxy setup, please specify your proxy host using this option. --proxy-port PORT If you are behind corporate proxy setup, please specify your proxy port using this option. Default value is 3128. --proxy-user USERNAME If you are behind corporate proxy which requires authentication, please specify your proxy username using this option. As of now, only HTTP Basic authentication is supported. --proxy-pass PASSWORD If you are behind corporate proxy which requires authentication, please specify your proxy password using this option. As of now, only HTTP Basic authentication is supported. --local-identifier UNIQUE STRING If you are running multiple copies of BrowserStackLocal binary (for better performance or other reasons), please specify unique strings for BrowserStack to uniquely identify them. You will need to specify the same string in Automate tests as well. --force-proxy This options routes all traffic via the proxy specified - otherwise, binary tries to connect directly as well for better performance. --local-proxy-host HOST If your local server is behind a proxy or you are using a proxy to log all communication to your local servers - please specify your proxy host using this option. --local-proxy-port PORT If your local server is behind a proxy or you are using a proxy to log all communication to your local servers - please specify your proxy port using this option. Default assumed is 8081. --local-proxy-user USERNAME If your local server is behind a proxy, and it requies authentication - please specify your proxy username using this option. --local-proxy-pass PASSWORD If your local server is behind a proxy, and it requies authentication - please specify your proxy password using this option. --daemon [start|stop] Starts or stop the binary as a daemon. Accepts only 2 commands: start, stop. Start will start binary in background. Primarily used in Continous Integration server scripts. --log-file LOG FILE PATH Logs all the output to the file specified. --pac-file PAC FILE PATH Path to pac file with which the proxy needs to be set. --parallel-runs Specify the number of parallel runs. 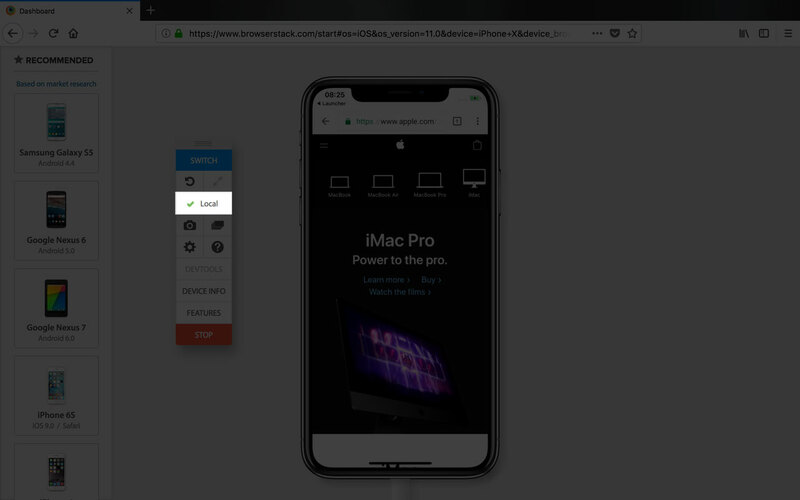 The connection between your machine and the remote machine remains open till you explicitly disconnect it, the browser window is closed, or you sign out of your BrowserStack account. The connection is persistent, and even if you accidentally close your browser tab, you can resume testing on reopening it. We are actively working on fixing these issues. "message": "QUERTY1 successfully disconnected" / "QUERTY1 was already disconnected"
2. For these APIs to include binaries in results, the binary should have been started with 'enable-logging-for-api' parameter. 3. In case the 'enable-logging-for-api' parameter is not used the response would have empty instance. However the instance would still be recorded in our database without storing any sensitive information.